The forum was so incredibly popular that we immediately exceeded our CPU limits and script allowances. I tried to plead with the host but they have "severely restricted" access to the forum as of a few minutes ago. (it is down for me, blank page). I already started securing a new dedicated box, but it will take me more time to migrate everyone over. So I ask for your patience. The forum is NOT dead and it WILL be back as quickly as I can make it... it just exceeded my expectations with regards to resources, and I didn't select a proper host the first time around. UPDATE: Was able to send a mass email letting all registered members know that we'll be back soon. This graph shows how we were blowing through their limits. I knew it almost immediately but it took me a couple days to negotiate with a new host over money. 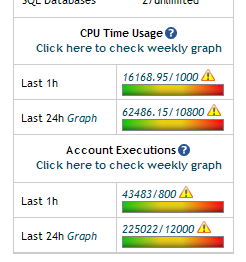 Below you can see we're allow 12,000 script executions per 24 hour rolling average. We were using over 43,000 an HOUR (43,000 * 24 = 1 million a day, when allowed 12,000). Poll results: Which NinjaTrader license?